Philips VisionPlus Automotive Lighting creates active safety technologies that are designed to illuminate your car, secure your road, and enlighten your world. Interweaving technical innovation with a genuine concern for the safety and driving comfort of those drivers who benefit from their products, Philips VisionPlus range of lamps enhances driving safety and comfort. Up to 50% more light on the road. When a driver installs Philips VisionPlus range of lamps, he/she makes an investment in enhanced driving safety and comfort. 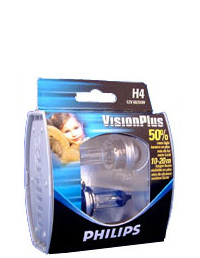 Philips VisionPlus halogen lamps produce 50% more light on the road compared to standard lamps. The extra light is measured at a distance of 50 and 75 meter in front of the car. Exactly were the car driver needs more light. A 10 to 20 meter longer beam for better road/sign reflection. Philips VisionPlus enables you to anticipate road obstacles, decipher traffic signs, and see other road users earlier than you might with standard lighting. The combination of up to 50% more light on the road with a 10-20 meter longer beam - at an average speed of 80km/h - results in a extra reaction time of up to a full second. That second can save lives. 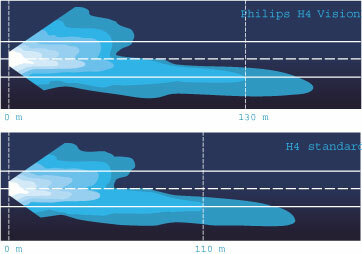 The same high quality and excellent beam performance found throughout the entire range of Philips Automotive Lamps. Philips vision of safety has always been an active one. Philips believe that Automotive Lighting is one of the rare automotive features that can actually prevent accidents rather than just surviving them. More light on the road allows you to see better. Better visibility allows you more time to anticipate all driving challenges. The rare combination of their extended projected light and the intense placement of that projection provides the VisionPlus driver with the right driving information at the right time. Active safety up to 50% more light on the road. Active safety better road/sign reflection.